An Easter truce was broken on Sunday when Ukraine and Russia clashed in the Ukrainian city of Slavyansk, resulting in a gunfight that left at least three and as many as five dead. The number of casualties is still unclear: initially, Ukrainian media reported just one victim, while Russian outlets reported five, including one pro-Russian activist. Ukraine later upped its count to three dead and three more injured. Also unclear is how the gunfight that shattered a fragile Easter truce got started. Russians blame Ukrainian nationalists for the attack, while Ukrainian officials say it was initiated by pro-Russian activists from out of town. Shortly after the attacks, the Russian foreign ministry released a statement that reads in part, "The Easter truce has been violated ... [The attack] testifies to the lack of will on the part of the Kiev authorities to rein in and disarm nationalists and extremists." Meanwhile, the Ukrainian foreign ministry released its own statement: "The Russian side must be reminded about their obligations under the Geneva agreement to bring all necessary influence to bear on separatists to clear illegally held buildings, unblock roads, lay down arms and prevent any bloodshed." The Ukrainian Right Sector spokesman took accusations further, calling the events "blasphemous" on the part of Russia. Slavyansk, one of several cities under the control of the separatists, sits in eastern Ukraine and represents another post-Crimea opportunity for Russia to seize Ukrainian land. This latest clash is the first since Russia signed a pact with Ukraine, the E.U. and the U.S. to ease tensions in the region. 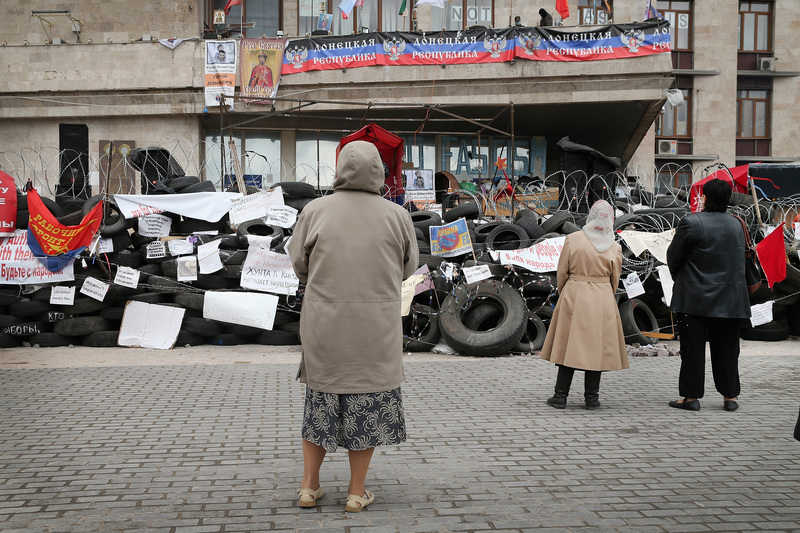 The agreement required that Russian separatists abandon the Ukrainian government buildings they have been occupying. But whatever the cause of Sunday's violence, it seemed to give militants occupying Slavyansk leverage to ask for help from the Russian government. In a statement released later in the day, the group pleaded, "Fascists are trying to conquer us. They are killing our brothers, carrying out open military actions against the people. We therefore ask that you urgently consider the question of sending a peacekeeping force to protect the civilian population." As tensions in the region escalated once more, Ukraine, along with other sites of civic tension such as Nigeria and Syria, was in the prayers of Pope Francis during Easter services at St. Peter's Square. The pope prayed for God to "enlighten and inspire the initiatives that promote peace in Ukraine, so that all those involved, with the support of the international community, will make every effort to prevent violence."